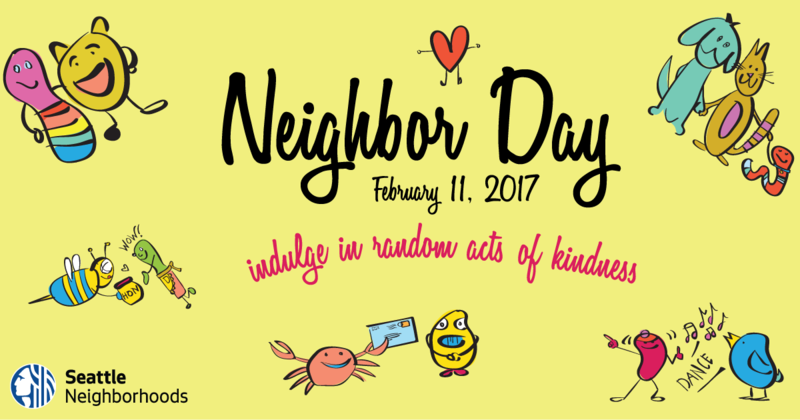 The Seattle Department of Neighborhoods invites all Seattle residents to celebrate kindness and community on Saturday, February 11, 2017—Seattle’s annual Neighbor Day. Neighbor Day was conceived in 1995 when Phinney Ridge neighborhood activist Judith Wood suggested that the City designate “a special day to celebrate the goodness in those around us and to reach out and strengthen our bonds to each other.” Seattle Mayor Norm Rice proclaimed the Saturday before Valentine’s Day as Neighbor Appreciation Day, and the observance has grown every year since. After a challenging 2016 that stirred up divisiveness and bitter debate both nationally and locally, we all need to remind ourselves that our greatest strength comes from one another. When we come together as communities and neighbors to share an experience, to express gratitude, to learn from one another, to support one another in times of need, to get to know each other – this is when we make the truest progress as a society. To honor that, the City of Seattle encourages residents to celebrate this day by reaching out to neighbors, indulging in random acts of kindness, making new friends, and expressing thanks to those who help make their neighborhood a great place to live. Do something nice for a neighbor—take them to coffee, clean up their yard, bake them some cookies, invite them for a walk. Organize a neighborhood potluck or open house. It can be as big or simple as you want. Join in a neighborhood service project. Clean up a park, paint a fence or rake leaves for a neighbor, plant a tree, or organize a neighborhood cleanup. Organize a Block Watch or emergency preparedness event. Seattle and most suburban cities offer resources through their police department’s crime prevention and safety units and their emergency management offices. Stop by your local fire station and meet the crew. The Department of Neighborhoods offers Neighbor Day resources for Seattle residents, businesses, and organizations —click here for ideas. For more information on Neighbor Day, visit www.seattle.gov/neighborday.